Lee Rust Dixon is a very talented seamstress, and wanted to showcase her unique fabric creations. She tried building her own website with GoDaddy software, but it never looked the way she wanted, the photos were always tiny, and it was difficult for her to update. She hired us to create a new website for her, where the photos would be big and bright, and she could update the site easily and often. 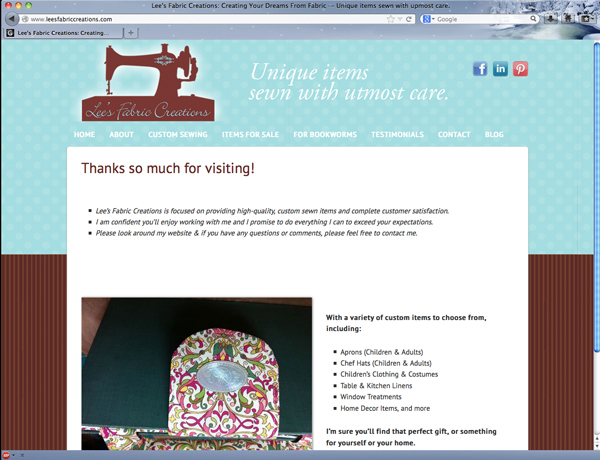 We worked together and came up with a fun site, and now she has no problem showing off her new creations!